The Irish Tourist Association conducted a survey of Ballina town in August 1942. 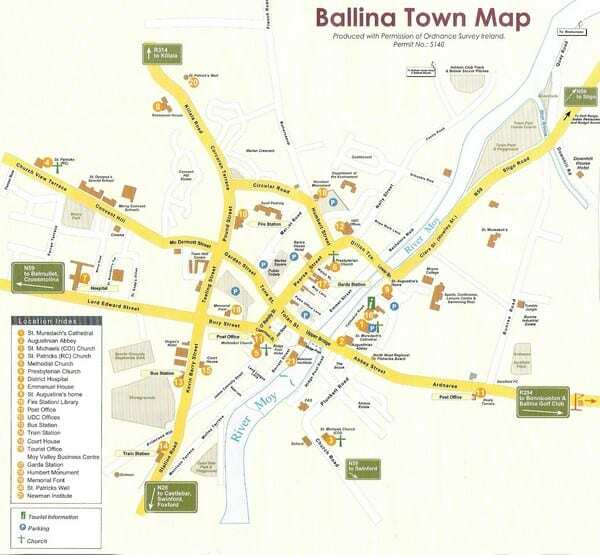 The aim of the survey was to determine the suitability of Ballina for tourism in the period of the Second World War. There were 6,000 persons living in the town 75 years ago and there were 6 hotels – The Imperial, Hursts, Moy Hotel, Walsh’s, Commercial Hotel and the Central along with the Downhill Guest House and the Nephin Hotel among numerous Boarding Houses and cafes. The cafes included Moylett’s, Hennigans, Byrons, Lynns, McHales, Bourkes and Mulderrigs. 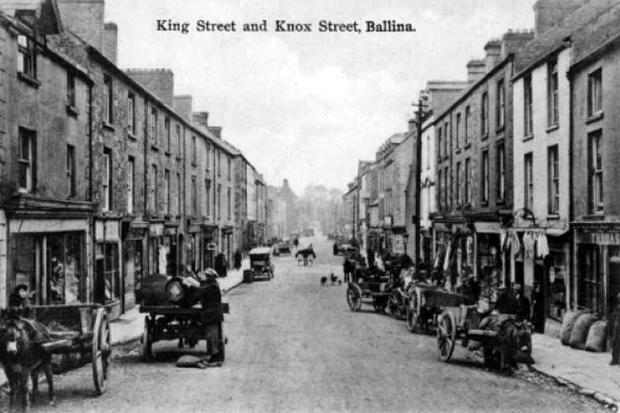 At this time the survey described Ballina as the largest town in Mayo and the third largest one in Connacht after Galway and Sligo. It reported that the town was prosperous and that the people were progressive. The main industrial base depended on flour milling, saw mills and corn mills. The town hall was called the Estoria and was the property of PJ Mulligan and there was a turf market and market square. There were two dance halls the Estoria and the Hibernian Hall which was owned by The Ancient Order of Hibernians, the cinema was called The Estoria. There were a good few churches in the town catering for the different Christian traditions in the town; there was the church of Our Lady of the Immaculate Conception,St. 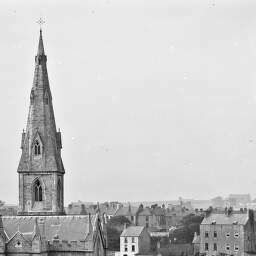 Muredach’s Cathedral, St. Michael’s Church of Ireland, the Presbyterian Church in Walsh Street and the church of Christian Brethren in Lloyd’s Lane. Often this writer heard older people refer to Pearse Street as Bank Street and this is no wonder as all the major banks in the town were located there. These were The Munster and Leinster, Bank of Ireland, National Bank, Ulster Bank, Provincial Bank of Ireland. Other businesses included James McConn, D. Stephens, and International Stores all that may be of interest to the reader. There were leaders in the industrial world at that time too; namely Joseph Murphy, James Murphy and Sons, Moy Fishery, John Egan, Hugh Ruddy and Kilcullen and Co. the industries included corn millers, flour millers, fisheries, mineral water and motor works and there were several garages and petrol stations in the town, these were Hopkins, Byrons, McAndrews, Clarke’s, Whites, Leonards, Connolly’s, Cottrell’s and Lynns, some of these did not have petrol pumps. The area was described as The Valley of the Moy and was encircled by the Ox Mountains and the Nephin Range including Nephin at over 2,500 feet high. Then at the estuary of the Moy there is Killala Bay and inland from here the mansion Beleek Manor and also along the banks of the river beside the cathedral there is Ardnree Abbey built in 1427. On the Killala Road then a rural area there was the Old Church at Leigue and there was the site of the old church at Beleek Manor called Kilmoremoy and thus giving the Parish its official name, there is a standing stone at Quignalegan and of course the well – known Cromlech of the Four Maols or the Dolmen as it is known today at the top of Primrose Hill. Other delights and services for the tourist included the many taxi and touring car firms that were in Ballina in 1942 and the many leisure pursuits like angling sea and Fresh water, golf and hunting and shooting, the golf fees were 2/6 and 5/ depending on the length of time required. The Irish Tourist Association was the precursor the Bord failte and failte Ireland and their surveyors travelled the land collecting data on the towns and villages and fortunately Co. mayo was well covered, a fuller study of the survey can be found in Mayo County library.